When we started this beach adventure, in 2003, with "Rosa do Campo" aka "the shack" as we liked to call it, we were far from imagine that this un-known Trafal ou Loule-Velho beach would turn out to be! 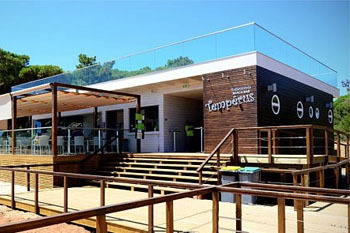 A dream hardly accomplished when on the 29th July of 2011 TEMPÊRUS RESTAURANTE BEACH BAR is 'born'. And, as in "Rosa do Campo", the simplicity of our menu and the cosy and familiar ambience is still our mark wich we try to keep and cherish always. An algarvian menu all the way ! Tempêrus offers you a full algarvian menu "stuffed" with the most various and tasty tapas, like our Octopus salads or Fish-Rowe salads, Algarvian style Mackrrel , Clams or Cockles, as well as, the best fresh fish from our coast, brought in daily from the best markets of the Algarve, namely Faro and Quarteira.